October was an ugly month for Under Armour (NYSE:UAA) stock. Until the very end. Going into the company’s third-quarter earnings report on Oct. 30, UAA stock was down 14% month-to-date. But, Under Armour impressed Wall Street with much better-than-expected third-quarter numbers and an above-consensus full-year and Q4 guide. UAA stock popped, and it finished October up 5%. For comparison purposes, the S&P 500 dropped 7% in October. Its peer, Nike (NYSE:NKE), shed 11%. Bulls think this out-performance will continue. They take comfort in the fact that third-quarter numbers were way above expectations, international growth remains robust, gross margins are finally improving, the stock remains dirt cheap relative to Nike on a price-to-sales basis and the stock is still more than 50% off all time highs. That is a lot of things to take comfort in. But, on the other side of things, most of the lift to the full-year earnings guide was because of tax noise, North America growth remains null and international growth is still slowing, operating margins are still down year-over-year, the stock is extremely expensive relative to Nike on a price-to-earnings basis and the stock is up 70% year-to-date. In other words, there are also a lot of things that should make investors worry at current levels. In the big picture, the cons outweigh the pros here and now. There simply isn’t enough top-line growth or margin expansion to warrant the current valuation on UAA stock. As such, this rally will eventually be short circuited by what has become an overstretched valuation. Under Armour’s third-quarter earnings report was good. But, it wasn’t that good. While headline numbers beat and gross margins improved, the report still illustrated that this is a low growth company with persistent margin issues. The top-line narrative remains the same as it has been at Under Armour for several quarters now. Q3 numbers didn’t introduce anything new. The North America business remains largely flat and tapped out, with revenue dropping 1% in the quarter. The international business is still growing at a rapid rate. But, that growth rate continues to come down. International revenues rose just 17% in the quarter. Last quarter, that growth rate was 24%. A year ago, it was 34%. So, while headline revenue numbers topped expectations, those numbers still suggest that this is a low growth company. The North America business is maxed out and has zero growth. The international business is slowing, and heading toward mid-to-high-single-digit growth. That combination implies low-to-mid-single-digit revenue growth rates going forward for Under Armour. Meanwhile, the market celebrated gross margins moving from down year-over-year to up year-over-year in Q3. That is a huge improvement. 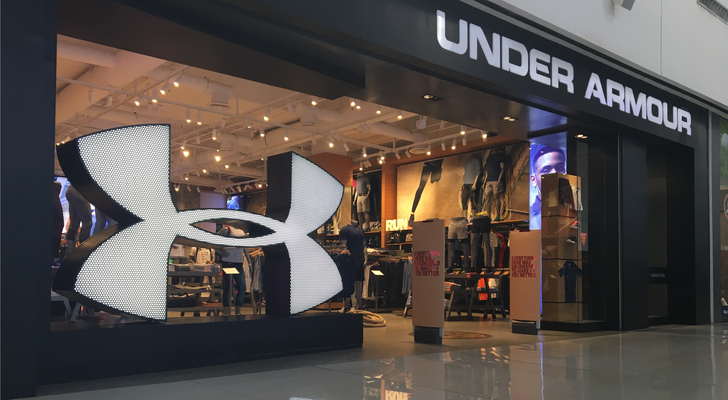 A big drag on this company has been adverse channel mix, as Under Armour has started distributing product heavily in off-price channels. This has diluted the company’s gross margin profile. But, in Q3, product cost improvements and lower promotions outweighed adverse channel mix, and adjusted gross margins actually rose year-over-year. The market celebrated this as a critical inflection point. But, gross margins only rose 20 basis points, and adjusted operating margins continued to compress. Thus, while the gross margin narrative is improving, the overall margin narrative remains quite dour. Last, but not least, Under Armour raised fiscal 2018 earnings guidance. But, a majority of that hike was due to a more favorable tax rate in Q4 than previously anticipated. Importantly, the gross margin and operating expense growth guides did not change. Broadly speaking, Under Armour’s third-quarter print was good, but not great. You got the double headline beats, some gross margin improvements and a nice lift to the full-year profit guide. But, on the other side, growth remains weak domestically and is slowing internationally, while the overall margin profile remains depressed. All things considered, UAA stock did not deserve to pop as much as it did after earnings. Before earnings, this was an $18 stock. Now, it is a $25 stock. That is a 40% rise as a direct consequence of Q3 earnings. But, the Q3 report wasn’t an up 40% report. The long-term outlook on this company remains one marked by mid-single-digit revenue growth, mild gross margin expansion from a depressed base and some opex leverage driven by steady top-line growth. If you model that out, earnings-per-share have runway to about $1.10 in five years, but not much higher, and growth thereafter will be limited by margins that will likely be maxed out by then. Thus, at best, UAA stock trades at a NKE-level multiple at maturity. NKE trades at 30X forward earnings. A 30 forward multiple on $1.10 earnings in five years implies a four year forward price target for UAA stock of $33. Discounted back by 10% per year, that equates to a year-end price target just under $25. Thus, in a best case scenario, UAA stock is already trading at its 2018 end price target. More realistically, UAA stock doesn’t get EPS to $1.10, nor does it warrant a 30 forward multiple at maturity. As such, this stock simply looks overvalued at current levels. Under Armour’s third-quarter report was good, but not “up 40% in a few days” good. At current levels, the valuation on UAA stock isn’t supported by long-term fundamentals. Consequently, the near-to-medium-term risk-reward profile on UAA stock skews heavily toward the downside.